THE owners of this beautiful 1860 house in Clifton Road bought it in a rather sad state around six years years ago when it was seen as the ugly duckling of the terrace, writes Gabi Tubbs. This was the second house in the Brighton area that Jayne and Simeon Adams have tackled, albeit their first experience with a grade II-listed property. Initially they weren’t terribly daunted by the prospect as it looked a fairly small job on the surface. Their optimism soon changed when it was revealed that a lot of the previous work had been bodged. As luck would have it, Jayne and Simeon found a brilliant builder. Jayne found Mark Draper when he was working on restoring a house with a ‘mock Tudor’ façade in Clifton Hill—a previously shortlisted contender for an MCHA conservation award. A lean-to at the back of the house became part of the kitchen with a skylight, making the space wonderfully bright. 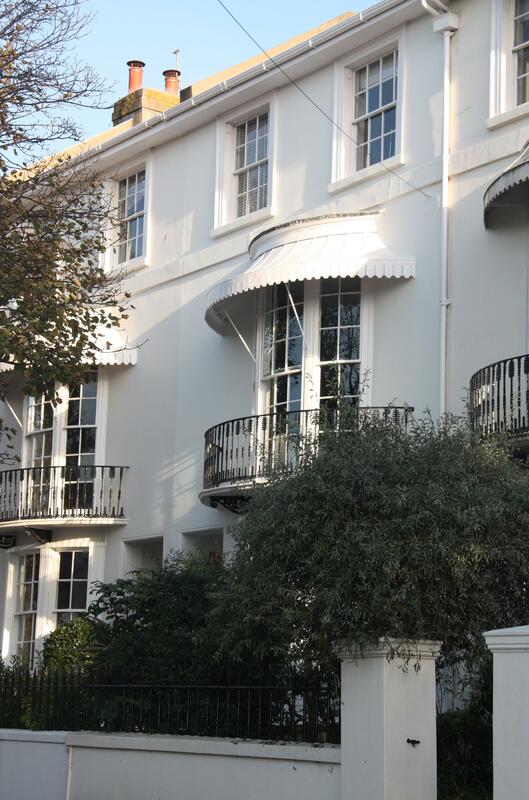 The outside wall was dutifully replicated in flint and bungaroush (the combination being a hardwearing and relatively cheap building material used in Regency Brighton). At the garden end of the sitting room a sash window was replaced with a French door, rather than the architectural glass doors they envisaged. After the cellar was damp-proofed the job became more complex. Renovating the rest of the house to their exacting standards took its time and implementing the work wasn’t easy as both Jayne and husband Simeon were commuting to London at the time. It wasn’t until last year that they decided to add the missing canopy to the exterior of the first floor. They got their builder Mark back to do the work. He made an exact template of the canopy of the house next door. Some of the balcony railings were salvaged and sandblasted and new ones made to replace the others. “This was the culmination of a lot of work to the entire house including reinstating the railings and step as well as substantial decoration works,” says Jack. Six years on the Adams couldn’t be happier with the result—as are their neighbours, who are thrilled to see this lovely terrace restored to its former glory, enhancing the street scene in Clifton Road.